How Soon can I go back to my Workout Routine After Hernia Repair? If you’ve undergone hernia repair surgery, you may feel better than ever and want to rev your exercise program into high gear as soon as possible. Not so fast. Although your incision may have healed, you still need significant downtime to ensure your hernia repair is a success. By starting slowly and gradually adding in more strenuous exercises to your routine, you’ll help yourself achieve the best possible surgical outcome. Taking it easy is the best course of action for the first two weeks after hernia surgery. Hernia surgery is a major procedure, and you need focus on rest and recuperation to ensure a full recovery. Week One – Walking only as necessary is the only exercise permitted the first week after surgery. Although you’re not confined to bed rest, you shouldn’t go to work or drive during this critical recovery time. Walk only enough to handle your basic needs, such as going to the bathroom, walking to the kitchen for meals, and walking to your favorite chair. Avoid minor chores like taking out the garbage or making your bed even if you feel up to it. Week Two – If you’re feeling better and no longer taking prescription pain medication, you can resume driving. Walk as much as you can as long as you don’t feel pain or fatigue. You can begin to perform light duty work. Avoid picking up anything over 20 pounds. Do not go to the gym or use home fitness machines. 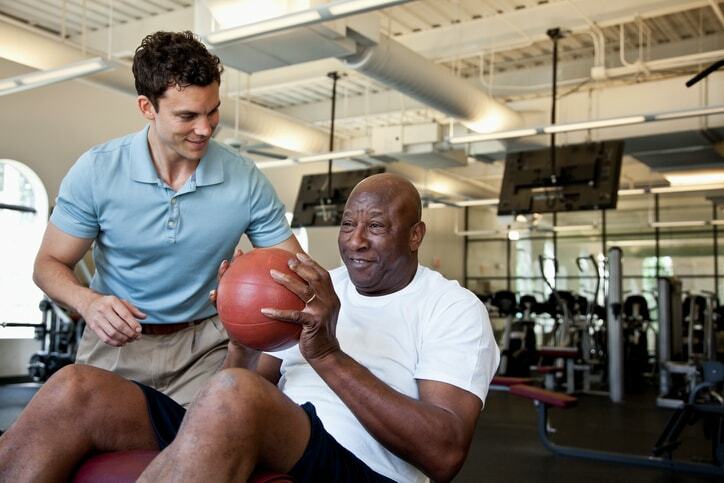 When Can I Get Start Working Out After My Hernia Repair? After two weeks, you can start to add some light exercise to your routine, focusing on exercises geared toward strengthening your core abdominal muscles. Exercise 1 – After a short walk, sit upright in a chair. While keeping your legs together, turn your upper body to right. Place your left hand on your right knee and use your right hand to hold the back of the chair for support. Stay in this position for 30 seconds and breathe deeply before repeating the exercise in the other direction. Exercise 2 – Lie on the floor or on your bed. While stretching one leg out straight, bend the other at the knee. Gently reach out for your foot on your outstretched leg using both hands. While keeping your back straight, bend at the waist. Make sure you don’t overdo it. When you feel stretching in your hamstring, hold the exercise for 30 seconds. Repeat the exercise on the opposite leg. At six weeks after surgery, you may add plank exercises into your routine for core strengthening. Avoid running, jumping, and other high-impact exercises until you are four to six months post-surgery. Use your body as a guide when adding new exercises. If you feel pain from a certain exercise, take it out of your routine. Don’t hesitate to call your doctor if you have any questions about your exercise routine or if you’re experiencing pain at the surgery site. If you suspect you have a hernia or need guidance on your post-surgery hernia exercise program, contact us today for a consultation with Dr. Mark Reiner in NYC. Dr. Reiner is a board-certified general surgeon who specializes in minimally invasive surgical techniques, robotic surgery, and minimally invasive hernia repair. Fill out the form on this page to request an appointment or call 212.879.6677 to learn more. © 2019 Mark Reiner, M.D. and docero, All Rights Reserved.